One of the tastiest Greek dishes ever! Crispy and creamy, the perfect recipe to serve to your guests if you want have success! 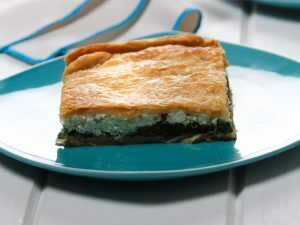 Ingredients: 300 g (10 oz) spinach, frozen thawed;300 g (10 oz) feta cheese; 120 g (4 oz) goat cheese; ½ cup butter, melted; 1 package phyllo dough; 2 eggs; ½ tsp ground black pepper. 1)Preheat oven to 190C/375F. Butter squire 20×20 cm (8×8 inches) baking pan. 2)Combine both cheeses with spinach, egg and a little bit of pepper. 3)Start layering phyllo dough and spinach filling into the baking pan, making sure to brush each sheet of phyllo with a little bit of melted butter. 4)Finish spanakopita with a sheet of phyllo brushed with butter, then make squire cuts all over the pie, making sure to cut straight to the bottom. 5)Bake for 45 minutes and serve warm or cold, sliced into pieces. 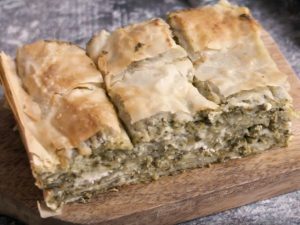 Borek: the best turkish recipe!